July 7: What's Jen Clicking on Between Newscasts? I'm not a Michael Jackson hater ... I just want to know what else is going on. Whenever a big story eclipses all the others, I spend a lot of time online to find out what I'm missing. If it's a local story, a lot of times that's a hard thing to do; many local news agencies are overextended and don't do any real reporting other than the Big Story that's dominating the news. In the Channel 4 Newsroom, we're running three crews right now on the Jackson story as of 6am. What would they be covering otherwise? What would any of these crews be covering? 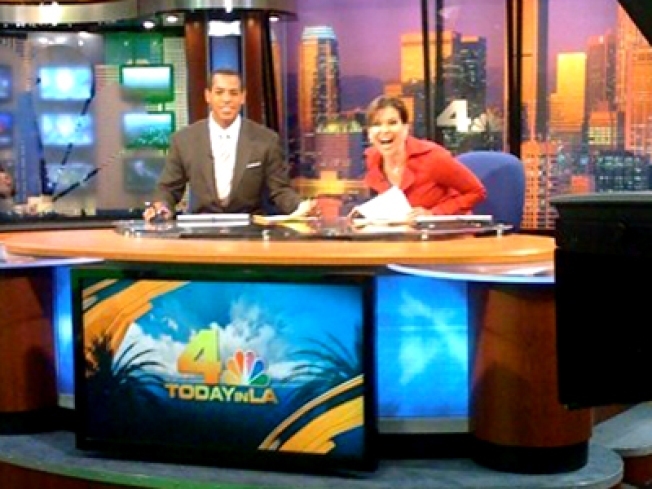 Gordon Tokumatsu was on around 4 this morning and hit the air at about 6am near Staples on Today in LA. Ordinarily he, and a crew assigned to him, would cover something starting at 9 or 10. On just our daily news logs, maybe a followup on the woman who shot herself to death at the Sheriff's station in Valencia yesterday. Perhaps a look at the Inglewood Police Department and the FBI probe that was opened into a shooting there ... or a the announcement of three arrests in a crazy alleged murder-for-hire scheme between what cops say looked like rival drug dealers on LA's skid row. I ran over to say hi to our news bosses and Assistant News Director Keith Esparros nodded his head and said, yeah, he got a little press release about that on his Blackberry last night and for sure, if Michael Jackson were alive today, we would have done something pretty substantial with that story. But he pointed out there is a lot of important news that's getting just blurb status because we're so overwhelmed with Michael Jackson coverage -- mostly in the arena of the economy, and politics. The state last week started issuing "IOU" promissory notes for some bills to conserve cash for priority payments, including payments to investors holding the state's debt. California ranks as the lowest-rated state general obligation credit by Fitch, followed by Louisiana, at "A+...."
...Lower ratings could raise California's borrowing costs during a severe cash crunch in Sacramento, the state capital, where talks between Governor Arnold Schwarzenegger and lawmakers to plug a $26.3 billion budget deficit for the fiscal year that began on July 1 are plodding along. "If we're forced to pay tens of millions of dollars, if not hundreds of millions of dollars, in higher interest costs because we have a delayed budget, that's tantamount to lighting money on fire," said H.D. Palmer, a spokesman for the state's Department of Finance. "That's money that we could be spending on things like health care or education." And as for those IOU's, we read a little blurb this morning between blocks of Michael Jackson coverage that people are holding on to them as souvenirs. This could be an unexpected coup for California, never having to make good on them. The LA Times story says some people are selling them for less than face value, as buyers on Craigslist say "what you need is cash, not a piece of paper," and there's speculation that these documents could eventually become collector's items. An IOU from the world's 8th largest economy? It's only the 2nd time since the Great Depression this has happened, and the state plans to issue $3.4 billion in them. "They're getting worse," Bass said of the negotiations between the governor and legislative leaders, "because I believe we're not talking about the subject -- we need to be talking about closing the deficit." Schwarzenegger, speaking to reporters in his office Monday morning, declined to criticize Bass, calling her a "great public servant" and "very passionate." One of the favorite stories I ran across this morning in my search for news was actually a bit of satire on the Huffington Post, where I was reading a story about Sarah Palin (another story the boss tells me we would be likely exploring with Los Angeles Republicans.) The headline reads: "California Cancels 2010." California Governor Arnold Schwarzenegger announced that his state will not participate in the year 2010, and instead "will skip directly to 2011." ...All state services will cease to operate, all state employees will be laid off, according to Mr. Schwarzenegger. "As far as California is concerned, there will not be a 2010. It does not and will not exist," he said. "If you try to call the police or the fire department, know that they will not be coming to help you. If you want a traffic light fixed, it may be time to take out your tool set and get to work with some handy friends. On the upside, you will not have to feed parking meters, and you won't be receiving any traffic tickets. If I were you, I would save that money, because you'll probably need it to pay for tutors for your children who won't have a public school to attend. But there's another upside for you kids: no school!" YES ... it's satire folks, but it would be funnier, I think, if it weren't so painfully close to the truth. Editor's Note: We'd also be covering all the events associated with National Ice Cream Month -- ice cream socials, competitive cow milking events, ice cream cone eating contests and dairy cow races, plus a look at how the lactose intolerant and those with cold-sensitive teeth will celebrate.